In My Brother's Keeper: A Memoir and a Message, one of America's most admired public figures tells the story of his life. Born in Germany in 1929, Amitai Etzioni escaped the Nazi regime and as a teenager dropped out of high school to fight as a commando in the Israeli War of Independence. He went on to earn his doctorate at Berkeley, teach at Columbia University and Harvard Business School, and serve as senior advisor to the Carter White House. Although he has authored or edited over 20 books, Dr. Etzioni's influence extends beyond academic circles as the founder of the communitarian social movement. In his own words, Dr. Etzioni reflects on his vision of a society whose members care profoundly about one another, assume responsibilities and do not just demand rights, and attend not merely to themselves, but also to the common good. He traces how this message spread and is playing a significant role in the public life of the United States, United Kingdom, and many other free and liberated societies. Clearly and engagingly written, Dr. Etzioni's vision and story are at once compelling and inspiring. This book is as much a memoir of the movement as of the author's life—the style is strictly policyese. This serious volume provides both a useful portrait of a public intellectual and the essence of a movement that may define public discourse in the coming years. 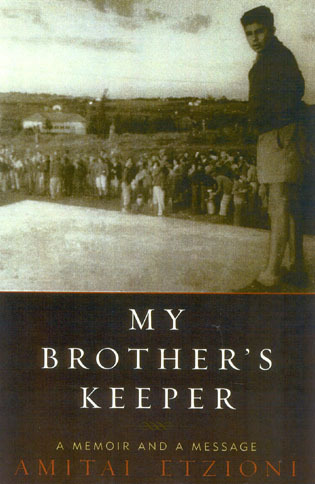 In this revealing memoir, Amitai Etzioni tells the story of his personal odyssey—as a young Israeli soldier, a determined student, a devoted family man, a distinguished academic, and an activist intellectual. He has drawn from modern sociology a latent yet vibrant public philosophy. In this book he opens his life and his heart; and he describes the inner workings of a social movement struggling to be born. This story will interest all who have been intrigued by the communitarian message.